I wasn’t liking what I was hearing. About the 45mm wider front end. The death of the Carrera narrow body. The fancy screens replacing most of the physical dials. The massive new wheels. 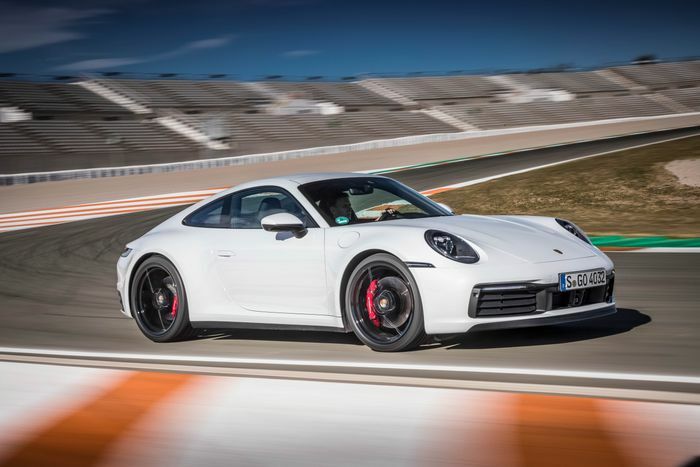 I’ve adored every Porsche 911 I’ve ever driven, because these cars have a habit of being almost irritatingly good, making most other sports cars feel comparatively rubbish. 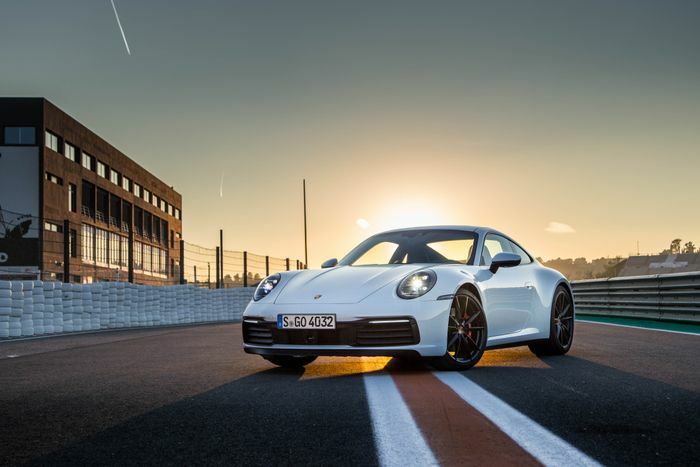 But when the first details about the 992-generation 911 landed, alarm bells started ringing. The counterpoint to all that’s good about Porsche’s iconic sports car is always that it’s getting too big, too over-tyred and too complicated for its own good. And the next one, it emerged at the LA Auto Show, was going to be… bigger, have even bigger tyres and increased in complexity quite dramatically. To cap it all off, I wasn’t really that sold on the looks. But I’ve since has a go, and now I feel very silly. Because within half a hot lap of Circuit Ricardo Tormo it smacked down my scepticism with one of the greatest drives I’ve ever had. It’s amazing to think that this is - at the moment - the entry point to the 992 world. There will be harder and more focused versions. And yet as a weapons-grade track tool, this new 911 Carrera S is sublime. You can be heavily loaded up in a fast corner like Ricardo’s ‘Champi Herroros’ right-hander, realise you’ve got your line completely wrong, make a hasty and unsubtle steering correction, and find that the car just isn’t fussed in the slightest. The high-speed stability is incredible. Impressive too is the traction - breaking the back end loose really takes some doing, and when it happens, it gets out of shape very progressively. Until PSM (Porsche Stability Management) cuts in and stops your tail-happy shenanigans, that is; something which happens earlier than you might expect even in Sport Plus mode. 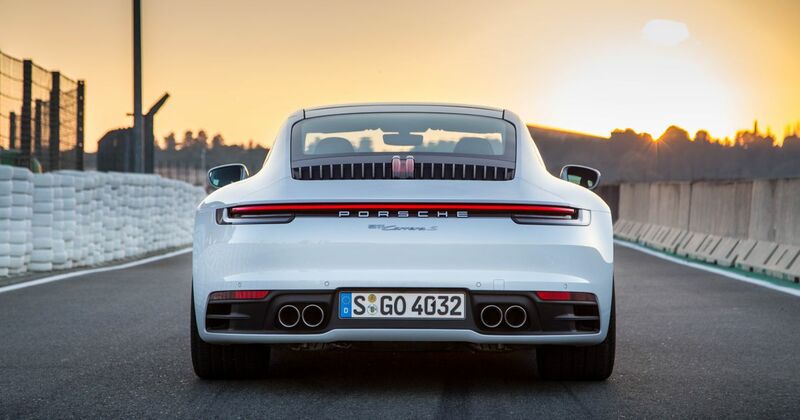 The engine may have been shunted forward a bit to accommodate the new eight-speed PDK automatic gearbox - which is there as it’s hybrid compatible, and it happens to be brutally efficient - but it’s still very much at the rear axle, defining the 911’s instantly recognisable shape while burying the rear wheels deep into the tarmac on the move. 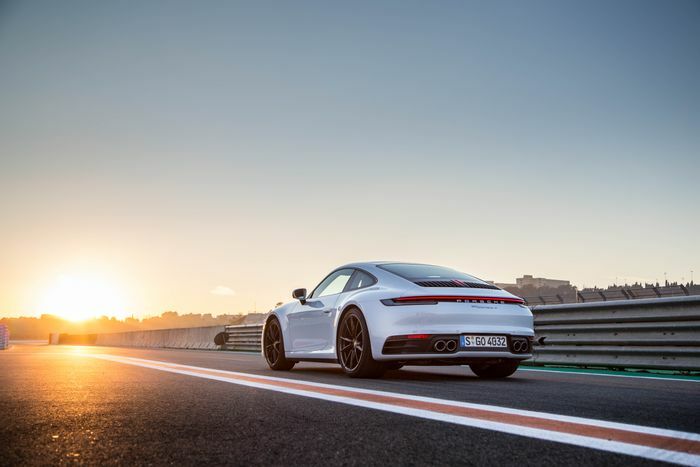 This should be a recipe for understeer, but there’s plenty of bite in the 992’s front end, even if it still has that light feeling to it that seems alien compared to more conventionally-arranged sports cars. It’s teamed up with weighty, predictable and feedback-laden steering. This steering reminds you with every turn of the wheel just how far ahead Porsche is of everyone else when it comes to sussing out EPAS. 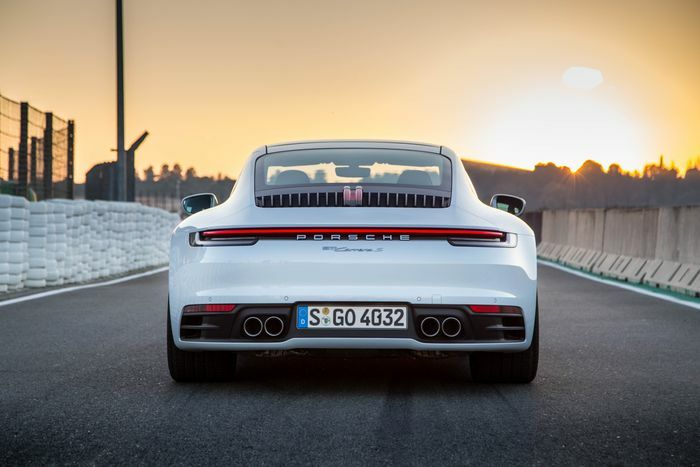 The ‘B6’ engine is effectively a second-generation version of the 3.0-litre flat-six which made its debut in the 991.2, enhanced with a litany of changes including new injectors, more responsive turbochargers and a higher compression ratio. You know what? I simply don’t miss the 3.8-litre naturally-aspirated unit, such is the flexibility of this newer lump, which is particularly handy in road driving. Whatever the engine speed, you can guarantee you’ll be punted out of the corner with vigour, and if you want, you can smash it into the 7500rpm redline. You don’t even pay for the mid-range thrust with turbo lag - it’s barely perceptible. Does it sound as good as the old N/A? 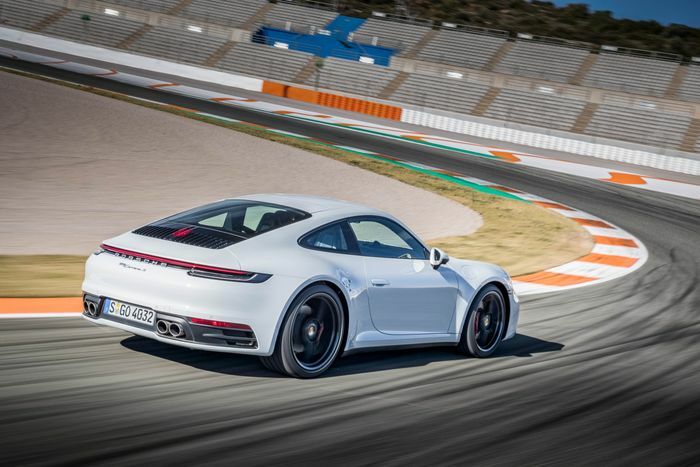 Of course not, and it really didn’t help 992’s case having it chase 991.2 GT3 RS instructor cars on track - that’s what you might call a ‘tough act to follow’. From the inside though, the 992 does a considerably better job of making its distinctive flat-six howl heard than the car it replaces. Under load, it seems as vocal as the Carrera T we sampled not so long ago, which has the benefit of a chunk of missing sound deadening. How, exactly, we’re still trying to find out - it might have some sort of sound tube piping induction noise into the cabin, or it could just be to do with the new exhaust valves. Anything else that’s new? Well, there’s a ‘Wet Mode’ which the 992 will prompt you to switch on when damp conditions are sensed. It does a good job of keeping things tidy when the heavens open - as I found on a wet handling course - but a combination of awesome wet traction and quick-reacting electronic aids mean the new 911 still feels confidence inspiring even when taking on such conditions in Sport Plus. The 10.9-inch infotainment system is much the same as the one found in the likes of the Panamera and Cayenne and is therefore very slick. 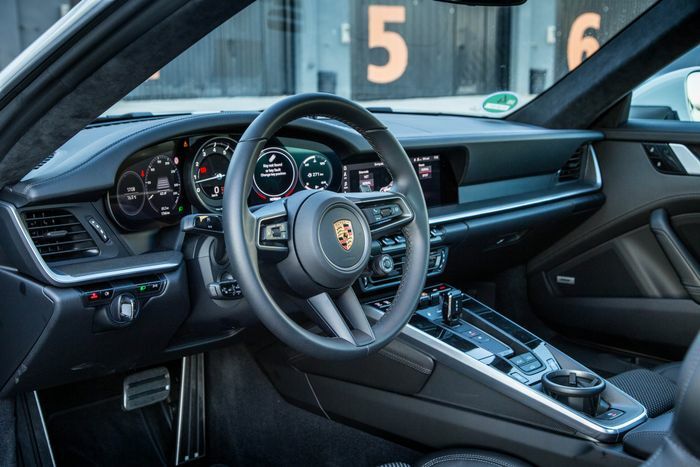 I’m less convinced by the seven-inch screens that flank the physical rev counter - they don’t neatly ‘wrap’ around the one manual dial like I thought they would, and I miss the full set of five old-school clocks the 991 heroically persevered with. The rest of the interior design makes up for it, though, with what Porsche calls a “horizontal emphasis” which harks back to 911s of old. And how can you not love the retro toggle switches? All of this adds up to one main conclusion. I was wrong, and I couldn’t be happier than the 992 smacked down my scepticism with a breadth of abilities that left me dumbfounded. Looking back, I’ve no idea why I ever doubted. Features Alfa Giulia Veloce Review: More Appealing Than The Quadrifoglio?